Attractive small Episcopal church in the middle of Royal Deeside; built in 1866, this was probably the last building designed by William Ramage. Nave and chancel under a roof with a single ridge-line, embellished with pretty cresting and a belfry (restored 2006). Fine collection of mainly Victorian stained glass windows and charming wrought-iron railings enhance the interior. Organ, of c1850s, installed in 1998. Notes on various items of interest are posted in the church. A fascinating and well-kept church and graveyard run by a thriving congregation. This church has resisted amalgamation and retrenchment by engaging its own Priests-in-Charge and this has resulted in growth. Most recently a 4 ½ year stint by Rev. Dr. David Greenwood saw the number of communicants rise by 70%. 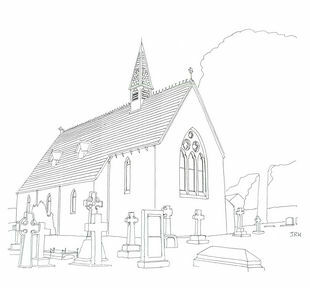 Since November 2018 we have had a vacancy and in March 2019 the Vestry produced a draft Congregational Profile prior to defining a Priest Profile and seeking a new priest to come and live and work in the community. While the services are strong on tradition we are moving with the times to use slightly more modern language for many services. Currently in Vacancy we have ‘professional cover’ for 1st & 3rd Sundays with an experienced lay team filling in the gaps. When there is a 5th Sunday our service of Choral Evensong with wine afterwards is a popular occasion not entirely because of the free booze. Full information of services and times is posted on our website. We have a small 4-part choir which started in 2008 and a lively Children’s Choir was started in 2019. The Children’s Corner is an added attraction for those with small children. We aspire to build a church hall. Note: Subject to change due to church festivals. Full information on services and times is posted on our website. The Church is open daily from 0800hrs (1000hrs on Sundays) to around 1700hrs.